Roman Saenko's spiritual successor to Hate Forest continues on this, a surprising third album from a side-project that went from a subtle debut release on Supernal Records to Candlelight for 2010's impressive Sun in the House of the Scorpion and to Season of Mist for this, the third album from the band. Any side project that makes it to three full-lengths in nearly a decade has to be considered a full band, and Blood of Kingu have earned the plaudits that came hesitantly with their debut but flowed much more freely thereafter. 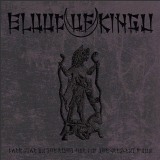 Combining the dark, elemental power of Hate Forest with an esoteric occult interest that goes beyond the dodgy Indo-Aryanism of before, Blood of Kingu seem to be more black metal than ever here, which is obviously not a bad thing by itself. Opener Crowned Scarlet Moon is Waiting for Eclipse may open with droning throat-singing and have a daft name, but the blasting black metal that follows is as heavy and direct as Hate Forest at their best, and it has a similar impact to early Enslaved with synth crashes and deep growls. This is powerful, back-to-the-woods stuff, and Saenko and co (long-term Drudkh members Thurios, Krechet, and for the first time, keyboardist Vlad are joined again by drummer Yuriy Sinitsky) are good at it. The crashing cymbals of He Who Is Not to Be Named are about as classically black metal as it gets, but the ambience that opens it and other tracks is odd enough to set it aside, even if this is a step back from the tribal weirdness of before. Blood of Kingu almost seem to be trying to prove something with the furious likes of Mother Hydra and Enshrined in the Nethermost Lairs Beneath the Oceans. Unfortunately, this is at a cost in terms of songwriting; Dark Star... is simply not as good an album as Sun in the House of the Scorpion thanks to songs that are utterly unmemorable, being repetitive and lacking individual personality. Things improve slightly in the second half of the album, after interlude Red Star on the Path of Ea, with Sigil of the Watcher's atmospheric deluge being potent enough to make an impact, but the sudden love of ambient interludes with Prayer to the Gods of Night basically repeating Red Star... isn't a good sign, and The Bringer of Pestilence and The Cycle Returneth sounding exactly like previous songs proves Dark Star...'s flaws. It may be a matter of taste, and Hate Forest fans will be delighted with the cold violence on show here, but those who enjoyed the originality in Blood of Kingu's ethnically-enhanced sound will find this something of a disappointment. I was very critical of the band's debut for playing it too safe and writing a sub-thirty minute album; what am I supposed to say seven years later for an album that commits the same crimes but for an extra ten minutes? Drudkh get enough stick for repeating themselves; it would be a shame if Blood of Kingu went down that road, especially when they're far guiltier of it. Good but best in small doses, Dark Star on the Right Horn of the Crescent Moon is the sound of a talented band playing it too safe.